Each of the films offer up a world oscillating between optimism and pessimism. The resulting form in motion suggests a sea change beyond this psychic impasse – towards something new, rich and strange. Combining imagery from myths, nature and social history, Gallagher creates multi-layered complex works in a wide variety of media that shift between abstraction and figuration. Her work questions what it is to be a contemporary subject, while examining the construction of identity in the modern world. She has been recognized for the sublime, poetic manner in which she illuminates societal issues in her art. The works exhibited at Bonniers Konsthall illustrate the ways in which infrastructure can be used to segregate social groups from one another, as well as how an interstellar origin myth can create the possibility of new form. Cleijne and Gallagher mine qualities inherent in different materials. The film installations are detailed and labour intensive, with each element having been subjected to multiple processes, creating distinct layers which capture and enchant the viewer. 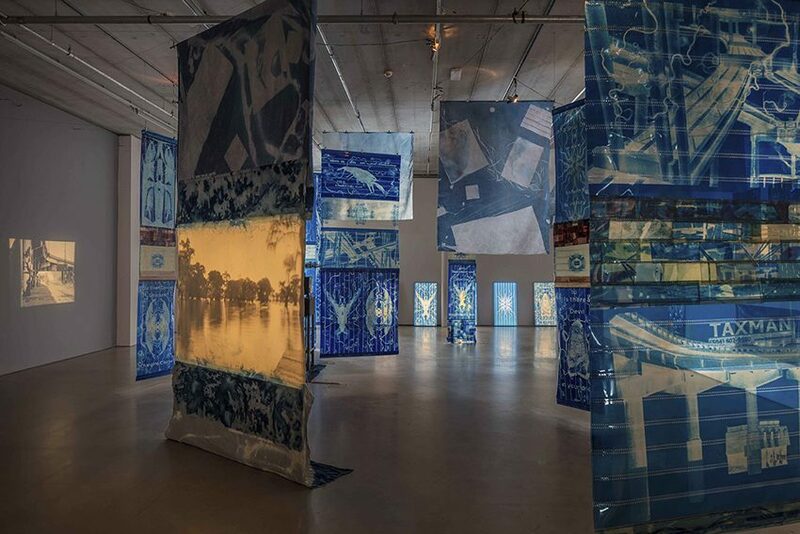 Highway Gothic (2017), the most recent film installation to be featured in the exhibition, consists of cyanotype banners of 70mm film and two 16mm film projections. The installation explores US Interstate 10 – as it cuts through both New Orleans and the largest wetland in the US, the Atchafalaya Swamp – displacing everything in its wake. The title is taken from the official typeface used on American road signs. Better Dimension (2010) is an immersive, expansive film installation inhabiting almost the entire space of one of the Konsthall’s larger gallery rooms. The projections are walled in by sliding panels featuring silk-screened graphic prints. A projected central image – John F Kennedy’s head rotating above a black vinyl LP – hovers over four synced projections of painted glass slides . The images slip between abstraction and specimen as the forms catapult through the filmic space from one corner to the other. Each time a viewer enters the space, a corner projection is interrupted, covering and uncovering the panels on the outside of the projection space. The outside graphics are based on the polemical broadsheets and pamphlets of Sun Ra; musician, philosopher and community activist, whose etymological interrogations were an inspiration to Malcom X. Like Sun Ra, who destabilized an origin myth to create the possibility of new potential, Better Dimension investigates the potential of abstract form approached through a composition of destabilized figurative elements. A visual poem, a graphic burial. Edgar Cleijne and Ellen Gallagher’s film projection Nothing Is… (2013) explores what the artists call “different aspects of representation,” the title taken from Sun Ra’s album and poem “Nothing Is …” from 1970. A line from the poem – The nothing and the air and the fire are really the same – describes Sun Ra’s thoughts on origin and elements teetering on the brink of multiple states, of simultaneously being and not-being. Ellen Gallagher currently lives in Rotterdam and New York City, and is renowned for her solo exhibitions at institutions including Tate Modern in London and The New Museum in New York City. The Swedish public knows her from a presentation of her paintings in the Eclipse – Art in a Dark Age exhibition at Moderna Museet in Stockholm. Edgar Cleijne, also living in Rotterdam and New York City, is a photographer and filmmaker. Photo: Edgar Cleijne and Ellen Gallagher, Better Dimension, 2010 (detail of ink and tape on glass slide). Installation of silkscreened wood panels, four Hasselblad slide projectors, one 16mm projector, resin and steel projection screen © Ellen Gallagher and Edgar Cleijne. Courtesy of the artist and Hauser & Wirth and Gagosian.